While the city has the highest rate of hit-and-run crashes in California, police devote limited resources to investigations — and only solve a small fraction of cases. 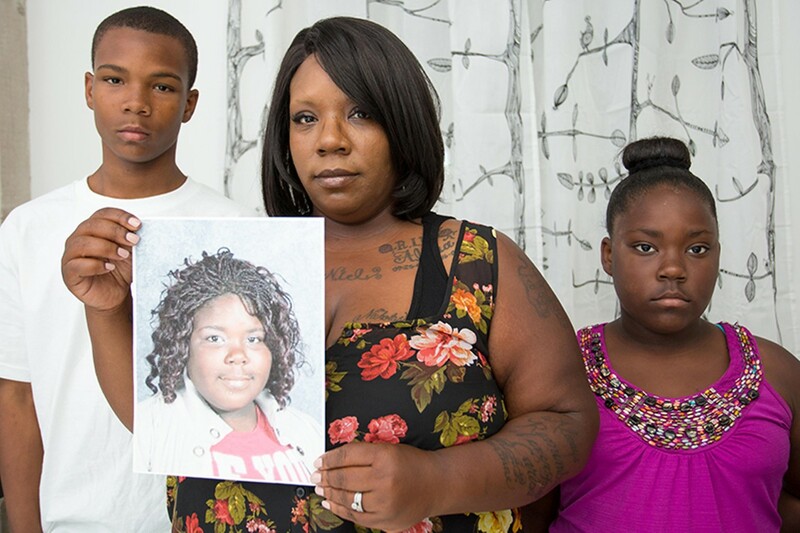 Tiffany Green (center) shows a photo of her daughter, Alana Williams, who was killed in a hit-and-run crash in 2009. Alana is survived by four siblings, including Joshua Williams Green (left) and A'zoria Williams Green. Some days, Tiffany Green struggles to get out of bed. 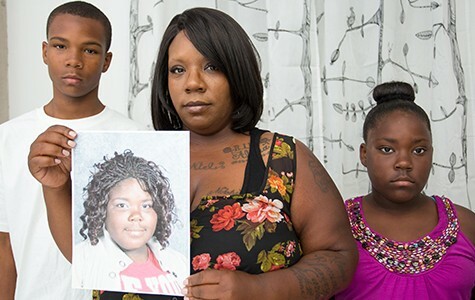 It's been more than five years since her eleven-year-old daughter, Alana Williams, was killed on the streets of East Oakland, but at times, the grief feels just as heavy as it did on the day she lost her child. "It doesn't get better. It just gets harder and harder," said Green, 32, in a recent interview. "I sit and wonder how she would be turning sixteen." Just after 8 a.m. on October 16, 2009, Alana, a sixth-grade student, got off an AC Transit bus on 64th Avenue and Foothill Boulevard on her way to Frick Middle School. After she took a few steps into the crosswalk, a black vehicle crashed into the young girl, according to the Oakland Police Department's official report. Police wrote that Alana was pinned under the vehicle, and that the driver, in an attempt to flee the scene, ran over her a second time. By the time Green arrived at Highland Hospital, it was too late. Her daughter was already dead. Years later, Alana's killer remains at large. Some witnesses said the driver was male, while others reported seeing a female. Police records that Green provided to me reveal that although investigators had obtained significant testimony from witnesses, video footage, and multiple leads about possible suspects, OPD ultimately failed to make an arrest. And while the case was particularly tragic, the outcome of the investigation was far from unique. On the contrary, data that OPD recently released in response to a records request by the Express reveals that the department very rarely solves hit-and-run cases. In 2013, out of 346 Oakland hit-and-runs in which victims were injured or killed, only 4 percent — 14 cases total — resulted in criminal charges. And out of 418 injury hit-and-runs in 2014, only 3 percent — 12 cases — led to charges. Out of the more than 7,000 total hit-and-run cases in 2013 and 2014 — a figure that includes incidents with injuries and fatalities as well as more minor cases, such as damage to a parked car — OPD has solved fewer than 2 percent of the crimes. This data is especially alarming considering that, according to the California Office of Traffic Safety, Oakland has consistently had the highest rate of hit-and-run crashes of any large city in the state. From 2010 through 2012 (the latest year for which data is available), Oakland ranked worst for hit-and-runs among the thirteen California cities with more than 250,000 people. The ranking was based on a formula that considers a city's population, estimates of car miles traveled, collision trends, and several other factors. State data also shows that in recent years, 14 to 16 percent of traffic collisions in Oakland in which victims were injured or killed were hit-and-run cases. That means roughly one out of every six motorists who injure or kill a victim flees the scene of the crime. And nearly all of them get away with it. While experts agree that hit-and-run cases are difficult to investigate — in part because it can be challenging to gather enough evidence to identify the vehicle or prove a specific individual was driving during the crash — it's clear that Oakland has failed to prioritize these cases. That's because OPD currently has just one hit-and-run investigator — Peter Huppert, a traffic investigations unit office who only works part-time on hit-and-run cases. With an average of ten hit-and-run collisions a day in Oakland — including an average of about one a day involving an injury or fatality — Huppert's caseload is unmanageable. "A lot of hit-and-runs are not being solved just due to a lack of information," said Officer Glenn Hara, a member of OPD's traffic investigations unit. Hara said OPD assigns additional staff to investigate fatal hit-and-runs, but that for all other cases, "it's a matter of prioritizing and triaging based on information we have." For the most part, he said, OPD only makes hit-and-run arrests when investigators are able to identify the driver immediately after the collision — apprehending the suspect near the scene, for example. "If we had more investigators that could conduct follow-up on some of these investigations, I'm sure it would be possible to solve more," Hara said. "There are not enough hours in the day to look at every single one of them — even the important ones." That explanation provides little solace to victims and their families. "I just felt like she wasn't a priority," Green said of her daughter. "It should've been solved. There were so many eyewitness and they had so many leads, and I think they just swept it under the rug." Green noted that, at the time, she did not have the emotional capacity to advocate for her daughter and pressure police to make an arrest. "I didn't really have a voice, because I was dealing with grief." In May 2011, OPD gave Green all the records of the investigation and informed her that the department would not be pursuing the case any further, Green said. "They told me there was nothing they could do." She hasn't communicated with police since. The police files paint a picture of an investigation that involved a team of officers who did extensive interviews and follow-up work, but also clearly made mistakes along the way. Most notably, one officer apparently viewed surveillance footage from a nearby restaurant that captured the suspect vehicle, but then failed to properly copy the video onto a CD and the footage was subsequently taped over at the restaurant days later, according to the report. Green never saw the video. She told me that she also thought police could have devoted more resources to the search for evidence linking the crime to a specific suspect — a local man whom police believed at the time may have been the driver, according to the reports. "They know who killed her," Green said. Alana was one of 26 fatal hit-and-run victims in Oakland from 2008 to 2013, according to state data. For the hundreds of other hit-and-run cases each year in which victims are injured, but survive, police devote significantly fewer resources — in some cases neglecting to do basic detective work. "The implicit message is, if you want to hurt someone, do it by car," said Michael Schwartz, an Oakland resident who was the victim of a serious hit-and-run collision that occurred last September — another case OPD has failed to solve. An Acura hit Schwartz when he was on his bike waiting for a red light to change at Foothill Boulevard and Lakeshore Avenue. 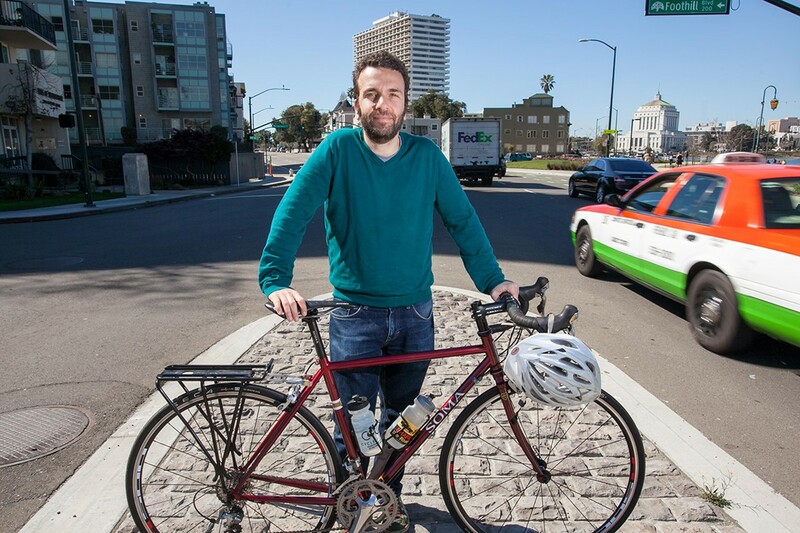 Schwartz is a member of Transport Oakland, a transportation advocacy group, and I wrote about his collision in-depth in a recent cover story on bike safety (see "Shifting Gears," 3/18). The driver, police records show, abandoned the vehicle a few blocks away from the collision. Still, police have not made an arrest — and have done very little to even track down the registered owner of the car. Huppert (whom Hara said was unavailable for an interview) attempted to call the vehicle owner and also made a phone call to the owner's probation officer, but did not take any other steps to find or question the individual, according to Schwartz. A few months after the crash, Huppert said the department would not be pursuing the case any further, Schwartz said. The message, Schwartz recalled, was, "I know who it is, I just can't prove it." Schwartz — who suffered a fractured shoulder, a torn ACL, and other injuries in the collisions — said he does not fault Huppert, but said that the officer clearly didn't have time to take basic steps. For example, Schwartz's friends picked up pieces of the vehicle left behind at the crime scene and helped him later canvass local businesses for possible surveillance footage. Because OPD's hit-and-run investigations are so inadequate, it's not surprising so many drivers flee, said Chris Garrett, an East Bay attorney who has represented hit-and-run victims. Garrett is a friend of Schwartz and advised him in the aftermath of his crash. "The sad thing is it makes sense to run," Garrett said of hit-and-run drivers. Offer Grembek, who is co-director of UC Berkeley's Safe Transportation Research and Education Center and has studied national hit-and-run trends, said the low rate of charges could impact crime rates. "If the perception of being caught is that it is something that is very, very unlikely, that might increase the proportion or the number of people that decide to leave the scene." In response to my questions about specific cases, OPD spokesperson Johnna Watson wrote in an email, "The Oakland Police Department is committed to conducting thorough and complete investigations." The inadequacy of hit-and-run investigations, however, appears to be a symptom of a much broader problem within OPD. According to a recent memo from Chief Sean Whent (see "Why Oakland Police Can't Solve Crime," 5/20), the department does not even attempt to investigate a vast majority of reported robberies and burglaries. An increased investment in investigations could help OPD fight crime — by discouraging people from committing offenses like robberies or hit-and-runs that currently carry very low risks of being caught. And better investigations — and resulting arrests — could also help victims and their families heal. "It's about bringing closure to the family," said Gregory Green, Tiffany's husband. Alana is survived by four siblings. "Not a day goes by that my wife and the kids don't think about her," Gregory said. In a recent interview, Tiffany Green remembered Alana as a bubbly eleven-year-old who loved school, drawing, singing, and wearing vintage clothes. Tiffany said she has worked hard to be strong for her other children — including ten-year-old A'zoria (who now closely resembles Alana) — but that many days are emotional roller-coasters. Even five years later, an arrest would help her move forward, she said. "It'll make it a little bit easier ... if they turn themselves in or the police do their job."